"The most difficult thing is the decision to act, the rest is merely tenacity.". © By David Irvine Henderson Daily Dispatch, N.C.
© Copyright, 2015, Susan P. Joyce. All rights reserved. January, 20th 2016. With the huge success of The Big Virtual Q2 and Q3! TAOnline Virtual Career Fairs held in June and September, which included names such as PwC, Northrop Grumman, BAE Systems, AECOM, Amazon, Altria, Verizon, Oracle, UPS, TSA, Best Buy, Anthem, and other military friendly companies, we are excited to offer the next event in the series. Join us for The Big Virtual Q4! Wednesday, January 20th, 2016. You're invited to meet face-to-face with military-friendly employers at the Corporate Gray Job Fair on February 23rd at the Virginia Beach Convention Center. Job Fair hours are 9:00 am to 12:30 pm, with a free career transition seminar starting at 8:00 am. December is a time of lights. A Christmas tree is topped by a star representing the Star of Bethlehem. During Hanukkah, the menorah recalls the miracle in which the lights burned for eight days on one day’s supply of oil. The seven candles of Mishumaa Saba are lit during Kwanzaa to symbolize the seven principles African people are urged to live by. Different people celebrate different traditions with those lights. One more light might not add a great deal of brightness. But a green light can carry a message that is different from the others. Greenlight A Vet, a nonprofit organization, is asking Americans to display a green light to honor veterans of military service. A green porch light, a green light in the window or a green light among the many lights used to celebrate the season will be a sign of gratitude for veterans who have devoted years and energy—and sometimes blood—to serve the country. A number of area businesses and organizations are collaborating to Greenlight A Vet. Kristy Hunt, an assistant manager at the Wal-Mart store in Henderson, said the store held a special Veterans Day promotion that featured green lights, as well as items such as Veterans Day sweaters. The green lights proved to be popular. They were completely sold out, Hunt said. But honoring a veteran can go beyond displaying a light. The Tri-County area is home to almost 10,000 veterans, of which 1,500 are receiving compensation from the Department of Veterans Affairs. While they bring their talents as well as economic benefits to the area, they also bring their own kinds of needs. Vance County Veterans Service Officer Linwood Martin said his main duty is assisting veterans in submitting claims to the VA for compensation for service-connected disabilities. The process can be complicated, especially if the veteran does not have documentation to show that a disability stems from active duty. Martin said he could use additional staff support to handle the many requests he receives from veterans. In addition to the veterans themselves, the office serves spouses of veterans. Another need for local veterans is transportation to the VA hospital in Durham. “It’s very difficult to get volunteers to do that,” Martin said. Warren County Veterans Service Officer Jamytta Bell said many veterans in that county also have problems finding transportation. They have relied on transportation services from Vance County to keep medical appointments with the VA.
“But sometimes emergencies happen,” Bell said. Finding transportation at the last minute is a problem. Veterans face a number of other problems. Some are unemployed or underemployed and underpaid, Bell said. Others are homeless. Although the military offers training in many career fields, some veterans have trouble adapting the skills they acquired in service to civilian jobs, she said. Vocational rehabilitation programs are available, but veterans may have to pay out-of-pocket unless they have a pension or are on disability. Until recently, Granville County was served by a part-time veterans service officer. He retired and the position is currently vacant. Some veterans from that county have sought assistance in Vance County. “I’ve had 23 contacts with veterans from Granville County in the past week,” Martin said. Jobs, health concerns, training: These are a few of the needs veterans encounter during the transition from military to civilian life. A coordinated effort by the community is needed to make that transition take place smoothly. Placing a green light on the porch can be an important symbolic gesture. Action can make the transition a reality. WASHINGTON (AP) - Recent veterans and Americans without high school diplomas gained some ground in the job market in November. The unemployment rate for men and women who served in Iraq and Afghanistan since 2001 fell to 4.2 percent from 4.6 percent in October. For workers on the lower end of the educational spectrum - those without high school diplomas - unemployment declined to 6.9 percent from 7.4 percent in October. But jobless rates ticked up for seniors and people in their early 20s. Overall, U.S. employers added a robust 211,000 jobs last month. The national unemployment rate held steady at 5 percent. 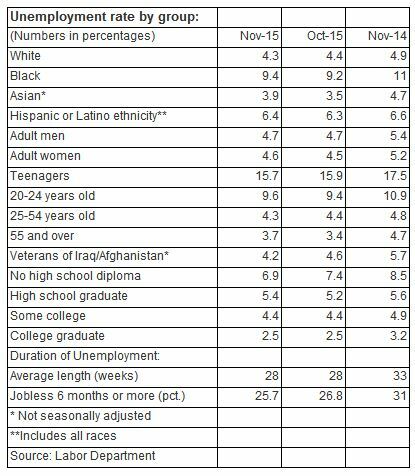 The data for various demographic groups came from a survey of households that is part of the Labor Department&apos;s monthly jobs report. Today, if you aren’t easy for recruiters to find and obviously qualified for the job they are trying to fill, you are not visible to them. If you aren’t visible, you won’t be hired for the job you want. Recruiters today are in a hurry to fill their jobs. The reason they don’t take more time is simple: the majority of recruiters are measured on their “time-to-hire” — how quickly they fill job openings. So, most recruiters don’t have, or take, the time to read a complete resume or social profile to determine if you would be a good fit for the job they are trying to fill. If you aren’t obviously qualified for their job opening, they move on to the next applicant or candidate. More than 90% of recruiters today use Google to find qualified job candidates. They are searching through Google’s gigantic database, and they are also often using Google to search through LinkedIn’s database of over 300,000,000 professional profiles. So, if you are a job seeker, you need to be easy for them to find quickly. Your goal is to be found on page one of Google/Bing/LinkedIn search results since very few searchers check the second or subsequent search results pages. Being easy to find is not really very difficult, but you must know the work you want (at least for this moment) to be found on the first page of search results. Without focus, you won’t catch that busy recruiter’s attention because you won’t have the right keywords for your job (more on that next) and you won’t make your qualifications for that job visible and obvious. You can change your mind about your target job next week, or even tomorrow, but for an effective job search today, you must know the job you are targeting. Vague I-don’t-want-to-limit-my-options goals are a waste of time now. 2. Know the best keywords for that job. People often use vague language in resumes and social profiles in the hope that they will be considered for many different kinds of jobs or because they aren’t sure the job they really want. Disaster! Recruiters aren’t searching using vague language, like “marketing professional” or “experienced manager” because the requirements in job descriptions are not vague. When you have identified your current target job (more specific than “marketing professional”), spend some time analyzing how employers describe that job. What skills, education, and experience are specified in their job descriptions? What job titles are used by your preferred employers for that job? 3. Use your best keywords in your professional visibility. For employers using Google and LinkedIn to find the right candidate, include your target keywords in your LinkedIn Profile, Google Plus, and other professional visibility online. Include your target job title (keywords!) in your LinkedIn Professional Headline. Describe your qualifications (with quantified accomplishments) that demonstrate your fit for your target job — more keywords. LinkedIn is the 800 pound gorilla in the professional visibility marketplace, currently, so start there. Google Plus is owned, obviously, by Google, so it’s a great spot (the About page) to tell Google what you want it to know about you. Many other sites can provide you with good visibility to support your LinkedIn and Google Plus profiles. See Reputation Management for a list of sites where you can establish solid professional profiles to support your job search. 4. Use the appropriate keywords in your applications / resume submissions. Posting a LinkedIn Profile and walking away is a waste of effort. LinkedIn is a “social network” and to be effective, you must visit it several times a week (daily is best). For a successful job search, my recommendation is to spend as much (or more) time on LinkedIn as you do on all your job boards combined. Today’s job search is more complex than in the past. For both a successful job search and career, being visible is a requirement (except for spies). So, build your visibility while job hunting and then maintain it for your career to continue building your online reputation. Phone screens are the great unknowns in the job interview process. I believe the phone interview is the easiest interview to prepare for and the intent of this post is provide reasons why and confidence. My goal is to change your view and potential fears of the phone interview. Most candidates fear the phone screen because we don’t know what to expect with this first call. If we do well in the phone interview and land the coveted in-person interview, we have an indication of what to expect based on the initial phone screen. When it comes to in person interviews, recruiters will often give the candidates some insight into what to expect and the names of the folks conducting the interviews. On the flip side, the phone interview is “first contact” and we don’t know what to expect or prepare for. If you are having a tough time moving past the phone screen, then you are probably missing something important on this call and hopefully this post will help. First and foremost, we need to be positive about the phone interview. Thinking about failure will become a self – fulfilling prophecy and recruiters can sense interview insecurity. It doesn’t smell or wear well. Remember, preparation is the best way to project confidence. The number 1 reason you should not be fearful of the phone interview is because you are one of the chosen ones. For most jobs out there, the recruiter or hiring manager has a LOT of resumes to pick from and they picked yours. Yes, for once, you are a horse in the race. If you landed a phone interview then you can assume the hiring manager feels you are qualified. You have to believe you are qualified. If there are no qualified candidates, we will change the headline on the job description or tweak the content of the job description. Recruiters will avoid candidates who are not qualified. We won’t waste anyone’s time, especially ours. So, don’t fret. You are not just in the ball-park, you are on base. The hiring manager is not just interested in you as a candidate, they are hopeful you will be the chosen one. Concentrate more on being qualified than how you might not be qualified. They called you! Play your cards right Gomer because you can win this pot. I have conducted a lot of phone interviews over the years and with most candidates, this stage is a weak link. It is surprising to me how many candidates do not have a grasp on the message they want to deliver. I would say that most of the candidates I talk with are technically qualified but they weed themselves out of the process because of how they present during the phone screen. In most cases, this interview is only 30 to 45 minutes long. What this means for most recruiters is that they only have time to ask about 10 questions. Remember, within this call, recruiters need to make introductions, conduct a little bit of chit-chat to take the nervousness off the candidate and then give the candidate an opportunity to ask questions. This only leaves time for 10 or so questions, but with this limited time, we should know what is coming. They are not going to waste time with “what is your favorite color” or “if you were an animal, what would it be?”. But what 10 questions are asked during a phone screen? Check out this link to the interview questions on this site here. These are not necessarily phone interview questions, but show the format of HOW to answer actual interview questions. Remember, the scheduled time will limit the number of questions that can be asked. This is not a session on the couch with your counselor. This is speed dating and we need to make an impression quickly. Here is what I want to know. You should absolutely have prepared answers for these questions. What do you know about Acme Publishing? What did you like about your last manager? What is your long-term / 3 year / 5 year plan? Why did you leave your last job? Why are you considering a new job? What do you look for in a manager? If you are like most candidates, you read through the list and felt good about your ability to answer the above questions. Based on the answers I hear, I believe most candidates read each question, formulate the first sentence to their answer (or came up with a general concept for an answer) and are quickly moving onto the next question. If you were one of the folks that came up with short one-sentence answers and moved to the next question, the interview process will probably end after the phone screen, if not before. You may not know it, but in the recruiters mind, finito. I hear a lot of great first sentences to interview answers during the phone screen but then most candidates stumble. They have a general concept of what they want to say, but they are not able to articulate a complete answer. This is a deal killer. Lack of articulation will equal the lack of an in person interview. One of the best ways to prepare for a phone interview is to write out a complete answer to the interview questions and then tape record what we sound like when we answer these questions. You will be surprised with what you hear. Remember, there are no “lemme start over” 2nd chances. The most common problem is that the candidate isn’t articulate. There is obviously an idea of what the candidate wants to say, but there is a lot of stumbling and a lack of well formulated thoughts. Having well thought out answers to the questions, writing out the answers in their entirety, and then practicing the complete answer out loud will make a big difference in how we present over the phone. With practice, we don’t miss points we want to make and the answer will flow. This isn’t cheating. If you were hired and later asked to give a presentation to a customer or the CEO, you would practice your presentation. You would not wing it. You would not come up with the first sentence and then assume “I got this ”. The other thing that listening to your phone screen answers will do is help ensure that we are answering the question. One of the big phone screen killers is being asked a question and not providing an answer. Having a pre-planned answer and then listening to what our answer is, ensures we are giving the interviewer what they want. The candidates are asked an interview question and the candidate gives a long explanation and background before actually answering the question. The hiring manager is losing interest in us as a candidate when we give background explanations before answering the actual question. Make sure to answer the question first and then provide any necessary background information. Q: What do you know about Acme Publishing? Non Answer: “I have done a lot of research. I have talked with friends, I obviously went to your web page and I have read forums on your customer service. I took a look at your year-end financials for the last quarter and saw you guys have a great Twitter following. I know that you guys did well last quarter and posted a profit. I saw on Twitter that you have 10K followers which is really good. I only have about 300 followers. Your web page says you were established in 1980 and have been in business for 25 years. I kid you not, I hear this stuff. The candidate thinks they are answering the questions, but they are really just providing me fluff and the first 4 sentences didn’t answer the question. Those first 4 sentences were DOG sentences. Each single sentence was equal to 7 sentences of a dog barking up the wrong tree. Better answer: Well, Acme Publishing was founded in 1980 and specializes in book binding and color catalogs for sports equipment. Customers are all over the world and include X,Y, and Z. Recently Acme has expanded to online web work and I am really excited about this part of the business. Per the financials, “we” posted a profit of about $1.2M on revenue of 15M and had year over year growth for the past 5 years. If the recruiter says “enough already”, you know you answered the question. The point is, answer the question. If you have a phone interview coming up, prepare well thought out and complete answers and then record your answers to ensure that you are presenting your best self. The sighs, the heavy breathing and loss for what to say will disappear quickly. ©TAOnline.com 1996-2015, All rights reserved.